CNEWA’s Michael J. La Civita sent us these images this afternoon, showing Archbishop Rafael Minassian visiting his flock. Armenia is rich in culture, history, faith and generosity. And thank God for that, for the poverty among some of its people is heartbreaking. Yet, how moving is the work of the church here. Although tiny — and scattered from Siberia to the Caucasus — the Archdiocese of the Armenian Catholic Church is led by a shepherd who smells of his sheep. “RAM,” as the archbishop [Rafael Minassian] jokingly refers to himself, is a man on the move, always thinking of ways to reach and greet and help the poorest of the poor. Some villagers from Vallakkallu, India, traveled to Marayoor to meet with journalist Don Duncan. 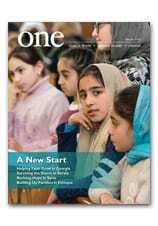 In the current edition of ONE, photojournalist Don Duncan reports on efforts at Breaking the Cycle of alcoholism and abuse in Kerala, and giving children a better future. Here, he offers some additional thoughts on India’s tribal culture. India’s constitution recognizes some 645 distinct tribes that it regards as disadvantaged or culturally vulnerable and thus it sets out provisions to both help these tribes and to protect their respective cultures. According to the country’s 2011 census, people from these “scheduled tribes” make up 8.6 percent of the population. Kerala state is home to 35 of those tribes and the tribal people make up 5 percent of its population. Known in Hindi as Adivasi or “original inhabitants,” the various tribes tend to live in insular communities, many of them geographically remote. They are often suspicious or distrustful of outsider contact and the government maintains certain policies that bolster this insularity in a bid to protect the tribes’ unique cultures from contamination from the wider, dominant Indian culture. As a foreigner, I was not allowed to visit the tribal village of Vallakkallu, which could be reached by a 15 mile trek cross country from Marayoor, the town I was based in for my reporting. “If you go there, the police could come and stop or maybe even arrest you,” my guide, Sister Melvy of the Sisters of the Destitute, told me. In fact, it is very difficult even for regular Indians to establish meaningful contact with certain tribes, so strong is their suspicion of outsiders or sense of insularity. The Indian government takes the cultural protection of its aboriginal tribes very seriously. That impulse in and of itself is certainly commendable. But, as I got deeper into my reporting — which explored child welfare issues such as lack of education, bad parenting and child labor — I wondered if the government’s well-intentioned policy of protection vis-à-vis India’s scheduled tribes did not also have certain negative, unintended consequences. While the tribal policy of the government does protect the cultural integrity of the tribes (as well as offering them material support), that same protection policy seems to also serve as a sort of obstacle to those charities/NGO’s wishing to help tribes improve their lot. A case in point is education. The Muthuvan tribe, which lives in Vallakkallu village, puts value and emphasis on working the land and doesn’t see the point of schooling. Attendance in the state primary school in the village is shabby and the only person who seems pro-schooling in any real way is the village’s sole teacher. I think this opposition between the value of working the land and the value of education is one that is familiar to many. In the West, we started, at a certain point in the past, to evolve from a land-based value system to one that put more value in ideas and learning: the “knowledge economy,” as we call it now. But each society evolves at its own pace and I think it is correct to respect the individual pace and nature of other societies’ respective evolutions. But can a people evolve naturally when they are “protected” and ghettoized on reservations? If left to their own devices, the tribes of India would most probably interact to some degree with others, adopt what they see as useful, and essentially evolve at a pace and in a way that suits them best. But with the way things are now, while the government does much to preserve the tribes’ fragile and unique cultures, it also risks fossilizing these people, holding them in suspension, while the rest of India continues to develop. Coptic Orthodox Pope Tawadros II met Dublin Archbishop Diarmuid Martin during a five-day visit to Ireland. “Christians in Egypt are now struggling for their existence,” he told Archbishop Martin on 18 May. Archbishop Martin told Pope Tawadros that Irish Catholics were “very aware of the suffering that your Coptic community has endured even in recent weeks,” a reference to a pair of terrorist attacks 9 April at two Egyptian churches. The Islamic State group claimed credit for the attacks, which killed at least 45 people, injured more than 100 others and shook the Middle East’s largest Christian community to the core. Pope Tawadros also met Irish President Michael Higgins, other foreign officials and members of the Coptic Orthodox communities. He also consecrated two Coptic Orthodox churches in Dublin and Waterford. The Coptic leader’s visit follows his pastoral visit to Britain, where he was received by Queen Elizabeth, Anglican Archbishop Justin Welby of Canterbury and the Prince of Wales. A villager and his horse make their way through downtown Eshtia, Georgia. Eshtia. Once a village of 1,300 families, now home to just 500 families — all Armenian Catholic refugees from the genocide a century ago. It is a tidy village of birches, daffodils and thieving magpies. CNEWA is proudly supporting Caritas’s work here in helping the youth, who number 300. While it seems as if time stands still, it does not. Many of the men men have fled to Omsk, Russia, to earn a living — leaving their families behind.